The embarrassingly lopsided defeat of Proposal 1, the linchpin of a plan to raise money to repair Michigan’s roads and bridges, offered some expected and unexpected lessons for state leaders. 1) Michigan residents want better roads. 2) The crappiness of your roads had no impact on your vote. Counties with the worst roads voted down the proposal just as overwhelmingly as the counties with the best roads. Voters hated the ballot proposal even more than the roads. 4) Don’t expect a committee to write something simple. The ballot language was written in a few hours by legislative staff in the rush of December’s Lame Duck session. The language reads more like a legislative bill, with all the horse swapping that that involves, rather than a proposal voters could understand. Successful ballot proposals are simple, straightforward, and well-tested in focus groups and polls. Here, support for the proposal went down when people read the actual ballot language. “This violated every rule of successful ballot proposals,” said Roger Martin, whose firm Martin Waymire led the advocacy campaign in support of the proposal (Martin Waymire also performs work for The Center for Michigan; it had no role in Bridge’s coverage of this issue). 5) Old-school political influence doesn’t exist anymore. The governor supported the proposal, going as far as to throw asphalt into potholes and make whistle-stop tours of the state. Democratic and Republican leaders supported the proposal. So did numerous business organizations, labor unions, police and fire leaders. Only one newspaper in the entire state urged a no vote, according to Martin. The rest, including the liberal-leaning Detroit Free Press and the conservative-leaning Detroit News, all endorsed it. Voters who get their news from friends on Facebook and Twitter don’t pay attention to old-school voting advice. 6) There’s a lot of anger and cynicism out there, and politicians better pay attention. 1) Does Tuesday's result mean Michigan voters want smaller government? Poll results seem to indicate the opposite. Michigan residents who participated in an Epic-MRA poll in April said that they were against cuts to education, social services and revenue sharing to local governments to pay for road repairs. A majority of Michigan residents are willing to pay more for better roads, according to the findings of community conversations and polls conducted by The Center for Michigan. 2) Does this affect Gov. Rick Snyder’s ability to run for president? For a politician billing himself nationally as a “problem solver,” it doesn’t help when he can’t leverage the weight of his office to solve a major problem in his own state, especially when Snyder campaigned vigorously for the proposal. That being said, Snyder’s approval ratings are high (48 percent positive to 36 percent negative in the Epic-MRA poll); Compare that to the approval ratings of the Michigan Legislature (27 percent positive, 67 percent negative) Since the same respondents were overwhelmingly opposed to Proposal 1, it appears Michigan blames the Legislature, not Snyder, for the mess. 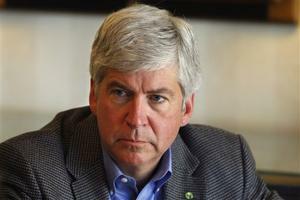 Snyder wanted the Legislature to find a way to fund roads without a ballot proposition. Apparently, voters agreed. 3) What does this mean for future ballot proposals? "especially when Snyder campaigned vigorously for the proposal....." Nonsense. He held a few press conferences holding up a piece of concrete and did a lame "bus" tour (yeah, that is really a great way to reach a lot of people) but appeared in no TV ads that I can recall. He didn't like the proposal and only went through the motions of supporting it. I'm sure someone somewhere was confused, but I voted around 5:00pm and I was around voter #180. Turnout was not huge...the people who voted were informed and interested in voting no for various reasons. As another poster stated, there are many on the Right who wanted to vote no to any tax increase, and many on the Left who wanted to vote no due to the legislature's failure to handle the problem as they should. I'd like to see the evidence for this "people who get their news from friends on FB/Twitter" nonsense...it comes off as lazy the way it's written. I'm starting to get annoyed by these sorts of comments on Bridge...even in opinion pieces people should back up what they say. Otherwise the opinion isn't INFORMED by anything worthwhile. Maybe you are a bit behind the times, but unfortunately, many people rely on social media to get informed. Yes, but IMO the article implied the social media posts are not somehow reputable sources....as if a social media post cannot contain an article from the Detroit News, etc. Just because some people use social media to consume news does not mean that social media is the ultimate source for that news. Yes, the point is taken that social media networks offer more influence these days than traditional ones, but that doesn't mean traditional ones have zero influence, or that people who use social media to get news don't also read or think about traditional newspaper endorsements. IMO newspaper endorsements mean as much as they always have...not much. People who use FB/Twitter also may listen to NPR, for example...your statement about me being "behind the times" is strange...as if social media and other news sources are somehow mutually exclusive...what? Matt....it didn't matter where the information came from . This proposal was another tax increase in favor of business over taxpaying workers . What's another couple billion dollars in taxes and fees on top of the other 2.5 billion or so dollars transferred from small businesses to retirees and working families . This bill included the return of revenue to those communities that lost revenue to the personal property tax being dumped by the voters last year . Transferring taxes from business to workers is not the way to go . This bill would again hit the everyday tax paying worker with the largest amount of the cost while taking it easy on businesses and the trucking industry . Seniors are the age group most likely to go to the polls, and we don't get our information from tweeter or fazebook. The Dems forgot to mention that the sales tax is the most regressive of all taxes, hitting the poorest hardest. The Dems forgot to mention that the education and EITC deals were not guaranteed, and could simply be stripped in the next Republican session. While nothing is worse than the Teabag Lickers, the Dems never fail to amaze me about the kind of hapless dupes they are. Do they really trust the Republicons? Sad. Just for the record, my only link to the Bridge is on Facebook. Yep right there between cat videos and pictures of someone's lunch. Next Bridge story is for you Paul: "Six things we love about cat videos (and three things we don't)". Just kidding. There aren't three things we don't love about cat videos. If you do want a link to Bridge, we offer subscriptions for the very reasonable price of zero. Sign up and you'll get Bridge sent to your email. Mr. French, If we read each article, sometimes we find it overpriced. The redeeming value comes in listening to what other readers say. The media refuses to print why people REALLY voted this down. We are tired of the representatives taking money from roads and schools and giving it to subsidies for big corporations that have NOT created jobs, that have outsourced jobs and hide profits overseas. If you look at the comments sections, you seethes theme over and over again. But You and the other media DO NOT REPORT this. Why? Pam - Many people on the left share your view. But there are many Tea Party-minded voters who voted against it because they don't like tax increases. They would have no interest in seeing more money go to roads and schools. Your characterization of people who reject all taxes for schools and roads as "tea party" couldn't be further off the mark. We pay taxes to support the things that individual units of government are unable to do. Like the rest of the 80% who rejected Prop 1, we don't endorse the mess that was presented to us and in particular, the idea of incorporating the sales tax increase into the State Constitution. Too many tax dollars are habitually wasted and the outcome is hidden from view unless some enterprising individual shines some daylight on the problem. Social media are expediting that process... and it's about time. I think the biggest thing was the 700 million that would be earmarked for "other" Thats a lot of money for someones slush fund. >the idea of incorporating the sales tax increase into the State Constitution. The state constitution must be amended in order to increase the sales tax. It's not a new idea...it's just a requirement already in place. That's the only reason we voted at all. Not so. The legislature has an infinite number of ways to raise revenues. The Teabag Lickers don't want to admit they lied to their constituents -- telling them there's lots of money sloshing around in Lansing. Raising taxes would be a clear indication they lied. So instead of doing their job, they fobbed it off on us. To add insult to injury, they gave us one choice -- which is no choice at all. The question remains: Are they stupid or do they just think we are? I think the voters answered that question. Exactly, Pam. It's an issue of trust as well as a reflection of the "rising gorge" of anger in the body politic. Personally, I found the ballot complex but understandable. In fact, I gained insight into the sausage-making process to follow monies from one area reallocated to balance another or infuse activity into yet another. I was one of the few, the lonely "Yes" votes in the wilderness, persuaded by a promise of increased funding to schools, to local government, to the EITC. Now all I have left is hope that we can still make that happen, but I fear the next solution will focus on roads and roads alone. Mrs. A, As much as I support the issues the Proposal 1 was designed to fund, I am skeptical that the government (Governor, MDOT, Legislature, local) are truly committed to spending other people's money wisely. They lack a means of accountablitlity and for that reason alone I voted No. Did you hear from any of the proponents any interest in getting better results for the money being spent, regularly reports on the the spending and how it was delivery the expected results, means to modify programs when necessary to achieve the desired results? I didn't. Let me offer a bit of substance to your hope, there are many ways accountability of programs and spending not only help establish trust they also make programs'spending more effective and provide better results. In all the things you support they would have more effective impact and garner expanded support with the added trust. If only the spenders would break from old dated political practices. My best guess is they want the results, they simply aren;t willing to make the necessary effort to achieve them when spending other people's money. People are tired of new taxes when they can not even manage what they have. Case in point - when the tax rate went up from 4 to 6 percent many years ago, the roads were supposed to have been fixed then. But it didn't happen. The people in Legilature think they can just use people's money at whim to buy themselves whatever they want. People are getting tired, working harder, and making less already. When will the Government wake up? The sales tax increase was for schools, not roads. And now they are taking the school aid fund to pay for other things. I am so tired of hearing "It was too complex". The citizens of Michigan are not stupid and the proposal WAS NOT TOO COMPLEX! Perhaps the real issue that over a third money raised was not going to the roads. There was also was no guarantee that the funds currently going to the roads would not be diverted elsewhere leaving us in the same condition. Raise the sales tax to fix roads "Yes". Raise the sales tax to augment the general fund and everything else "No". Before the road money (4%->6%) was diverted elsewhere, "elsewhere" didn't have that money. They shouldn't have it. It's for roads. Get it back. ...and if that's not enough, cut maybe 10% (yes, just 10%) from the costly "tax expenditures" to businesses who actually don't deliver promised jobs or economic growth, and voila', we're on good roads. Case in point: Filmmakers. Scam. Fraud. Voters in at least two units of local government in my area have voted millage increases to increase money for road upkeep! We all know how much everyone loves higher property tax millages - not so much! But, one of these passed county-wide, and another in a heavily rural township, so we can at least preliminarily conclude that both right wingers and more liberal voters will increase their own taxes to fix the roads - and ONLY the roads. Besides all the ancillary stuff for education, earned income tax credit, etc. Prop 1 wanted to give lost of money to mass transit, bike paths and snowmobile trails. These are NOT the things that are costing Michigan residents hundreds and hundreds of dollars a year in vehicle damage! A clean deal that asks EVERYONE to pay their share (this should include increasing registration rates on heavy trucks which do a huge part of the road damage due to their much higher wheel loads) would make most voters happy, and likely would have passed in a ballot initiative. Why can't the Legislature get past their pet opinions and ideology and get a grip on this set of facts? The author's arguments seem sound, although the governor never was enthusiastic about the proposal. The complexity of the proposal was its major flaw. Voters tend to vote no on any proposal that's difficult to understand, favoring the status quo. Typically, endorsements by elected public officials and newspapers do help proposals, but not in this case. It would have been interesting if Epic-MRA had asked likely voters where they got their information about Proposal 1. Perhaps the internet has returned patterns of political communications back to the "two-step flow" where people get their information and rely on the opinions of better informed colleagues, friends and neighbors posting on sites like Facebook. Studies have shown that the influence of the traditional newspaper endorsement has been greatly diminished over the years in influencing the public. With so many other options to get information on a subject these days that is not too surprising. I suspect the newspapers think they are more influential than they actually are these days. Why do you effete journalists condescend to claim that the voters were confused and could not understand the proposal? We understood it well. It was a heap of dung that stunk to the high heavens. Hi Geoff, the reason journalists (effete and non-effete) are saying it was confusing is because almost everyone we talk to say it was confusing. There were too many moving parts. Those who did speaking engagements on the topic spent half their time explaining how the money was being shuffled around by the proposal. We're not saying voters were too dumb to figure it out; we're saying that the harder you make people work to figure something out, the harder it is to convince them of the merits. The old saying "if you're explaining, you're losing" comes to mind. Thanks for reading. This comment would have been much more effective in the original article. The way it was written does not explain what you mean in this way, in my opinion. I think that's why you're seeing several comments suggesting that it sounds condescending. Mr. French, Being confused about the language of the Proposal and voting No are necessarily a cause and effect relationship. It seems that legal confusion may have been only a symptom of the root cause, but if the reporter were only hearing what they wanted/expected to hear they may have missed and opportunity to delve deeper into the why. I've been looking for the right description. A "pile of dung" is perfect! For road and bridge repairs, taxing fuel as a "use" tax is the most fair source of revenue. Why can't this happen in Michigan? I'm reminded of 1997, when Gov. Engler (R) desperately convinced the legislature (controlled by Republicans) to raise the State fuel tax after the Governor of Virginia (another Republican) lost his re-election over the state's roads. The solution is straightforward-raise the fuel tax. This proposal did increase the fuel use tax with revenue specifically bound to transportation funding and maintenance. But a use tax can put a disproportionate burden on low-income earners, which is why the EITC funding was available in this proposal. We need more focus on what policies/laws/decisions failed to maintain our infrastructure. Quick fixes are becoming the norm and are one of our biggest problems. They are short and to the point but do not keep the same problem from happening again. Don't propose a quick fix without 50% addressing changes on how we do business. The funds generated can be earmarked/targeted/promised/restricted to get the roads fixed but what can be done to improve the way we do business, promises ONLY? Doesn't work. Point 5 is telling. In the past several elections, I've seen the best candidates properly endorsed by newspaper editorial boards who eventually lost. The days of newspapers being a source of influence and enlightenment are fading. T.R.......You are correct IMO. The Midland Daily News has endorsed Republican candidates almost exclusively since I came to Midland in 1998. It's a running joke now. Nobody cares who this newspaper endorses because it will virtually always be the Republican candidate anyway. The question to be asked is why were both major newspapers in Michigan "in the bag" for Proposal 1 when the public so overwhelmingly rejected it. So much for watching out for the best interests of the public. Newspapers watch out for their own special interests, not those of their readers. Gannett is a major example of this. A few fact checking items here.. Carol says she was opposed to “the idea of incorporating the sales tax increase into the State Constitution”. Carol, the sales tax is already in the Constitution. Article IX, Section 8. Jerry says: “I think the biggest thing was the 700 million that would be earmarked for “other” Thats a lot of money for someones slush fund.” Here are the "other": School aid fund. Revenue sharing. EITC, to help offset the inherently regressive nature of our state's state and tax system that would be worse if the sales or gas tax is increased. General Fund. No slush funds here. Larry Ruby says: Case in point – when the tax rate went up from 4 to 6 percent many years ago, the roads were supposed to have been fixed then. Larry, the sales tax rate went from 4 to 6 percent to cover massive cuts in property taxes, and the money was earmarked for schools. Sales taxes have never been "supposed to" go to roads. Sorry. Lee says There was also was no guarantee that the funds currently going to the roads would not be diverted elsewhere leaving us in the same condition. Actually, yes there was, Lee. The state now dedicates all $ from the gasoline tax to transportation. This raised the gasoline tax (changing it to a wholesale tax) and then eliminated the sales tax from gasoline. All gasoline taxes go to transportation. Dwhyte says: (this should include increasing registration rates on heavy trucks which do a huge part of the road damage due to their much higher wheel loads) would make most voters happy, and likely would have passed in a ballot initiative. Why can’t the Legislature get past their pet opinions and ideology and get a grip on this set of facts? Dwhyte, the proposal did raise registration fees on heavy trucks, and increased diesel taxes to make them equal to gasoline taxes. Re: cutting truck weights, the research all shows the issue is how much weight there is on an axle, not overall weight of vehicle. It's the voters who have "pet opinions" who refuse to review the data. On this one, the lawmakers have the data on their side. As they say, everyone's entitled to their own opinion. But not their own facts. And yes, I worked hard to pass this proposal, and still think it was a vital piece of our state's economic comeback. It fixed the roads and helped mass transit, vital to attracting young talent to our state and helping urban workers get to jobs, including in the suburbs. It restored cuts we have made to schools (cuts that are responsible for us now having one of the least effective school systems in the nation) and cities (cuts that forced layoffs of thousands of police and firefighters.) And it addressed the regressivity of our current tax system by restoring the EITC, cut a couple years ago as a budget tightening element that balanced the budget on the backs of the poor. I guarantee you, the Legislature now will come up with a solution that is not as good as Proposal One was in moving Michigan forward. Hurrah for David Waymire. His corrections of misinformed posters were dead on. The level of misinformation among Michigan voters is appalling and frightening. That said, I do disagree with Mr. Waymire on one issue. He says, "It restored cuts we have made to schools (cuts that are responsible for us now having one of the least effective school systems in the nation) and cities (cuts that forced layoffs of thousands of police and firefighters.)" We have not cut education funding under Snyder. We have cut the amount going into the classroom because we needed to shore up the teachers' pension fund. I regard making contributions to MPSERs as a legitimate cost of education. David, MI Democratic Party.....neutral on Prop 1; MI Republican Party.....neutral on Prop 1; MI Chamber of Commerce....neutral on Prop1. Got any ideas why??? David thanks for setting the facts straight. Proposal one was not complex it was comprehensive in addressing numerous issues. Agree or not agree there was a logic behind the many moving parts. My take away from the defeat of proposal one is the public prefers to address only the road funding issue. 67% of those polled are willing to support more funding for roads. Raising the registration fees and gas tax is the most straight forward solution and can be done legislatively. Yes, we will be left with a sales tax on gas that goes to the general fund, which some my argue is poor public policy but so be it. My concern is our legislators will do little or nothing to address the road funding issue. I spoke with numerous colleagues and friends - basically we are fed up with our representatives wasting our hard earned money and not applying the monies the state takes from us working folks to deal with the highest priority items (those that impact ALL citizens - roads being one of them as that is how goods get delivered to all of us) first. It's like a family eating dinner out every night and not paying their mortgage. We elect our representatives to be good fiduciaries of our tax dollars and they have proven not to be. How much was wasted on film subsidies?, extended unemployment benefits, other crap to buy votes? Hey Snyder - I voted for you and am disappointed - show some leadership. Cut the handouts to the healthy but lazy and use the money to support the taxpaying population. State government does not need more money - they need to manage what they get responsibly. Voters were pretty discerning. In contrast to Prop 1, many communities supported new or continued millages to pay for local services. The other major element missed in this report is how out of touch the Legislature is with their constituents. They could not come up with a plan and therefore Randy Richardsville cobbled up this Proposal 1 and convinced Governor Snyder to take it on (the chin). This is the same Randy who continued to support the failing Film Industry Subsidy and other MEDC actions of Corporate Hand Outs, not to mention the huge tax swing from business to individuals. Randy was on his way out due to term limits. I suspect he too was looking for a "legacy" move that he could play out for a future political endeavor. They blew it all away! I think the taxpayers are really fed up with the taxes and/or money that they are paying to the state that do not go into the funds that they were originally established for. There is already a gas tax out there for the roads but that money isn't going there, it's going to other places in the general fund because previous governors/politicians have found a loop hole so they could divert that money. Lottery money isn't going towards the education like it should be either so our schools are lacking (I personally refuse to buy lottery tickets because of this). If our governor wants to be successful and gain taxpayers' trust he should be applying these monies to where they are supposed to be going and finding out other means to fund the general fund by either increasing revenue or making cutbacks. There is a lack of trust out there right now. The state budget needs to be overhauled and made right before taxpayers are going to vote for any more increases in taxes. As David Waymire pointed out above, all the fuel taxes do, in fact, go to transportation. And, contrary to Diana, who says, " Lottery money isn’t going towards the education like it should be either so our schools are lacking, " the lottery money does go to schools. It always has. It is true that the state legislature cut general fund transfers to the School Aid Fund by an equivalent amount, so the lottery money was not a net addition to the school fund, but all of the lottery money does go to schools. In any event, the lottery money only constitutes a small percentage of the School Aid Fund. Wake up, Prop 1 is a poster child for political sausage making. Taxes by themselves don't fix roads. Instead of a hot dog, we deserve a five course meal of fixes for all the money we spend on roads, as follows: 1. Our laws governing truck weight restriction allow for the heaviest loads in the U.S. and Canada. 2. MDOT buys and maintains for us the roads we have. What they buy is poor quality, then they accept even poorer quality because they don't follow their own QC rules. 3. Fixed rather than indexed tax rate on gas funded reduces funds every year. That is nuts! 4. Maintenance funds should be apportioned partly based upon traffic not just miles of pavement. 5. Stop calling it a ROAD TAX, like some feudal lord in his castle. Add an inflation indexed USER FEE to gasoline and diesel sales. Increase that fee a little every time prices go down until a rational budget and maintenance program is in place. Do I believe this could ever happen? No. We love to complain about the process because it's emotional. Instead we should be complaining about the results, which are physical, can be analyzed rationally, and addressed logically. But that's too much like work. Wake up, Prop 1 is a poster child for political sausage making. Taxes by themselves don’t fix roads. Instead of a hot dog, we deserve a five course meal of fixes for all the money we spend on roads, as follows: 1. Our laws governing truck weight restriction allow for the heaviest loads in the U.S. and Canada. We have the worst. 2. MDOT buys and maintains for us the roads we have. What they buy is poor quality, then they accept even poorer quality because they don’t follow their own QC rules. 3. Fixed rather than indexed tax rate on gas reduces funds every year. That is nuts! 4. Maintenance funds should be apportioned partly based upon traffic not just miles of pavement. 5. Stop calling it a ROAD TAX, like some feudal lord in his castle. Add an inflation indexed USER FEE to gasoline and diesel sales. Increase that fee a little every time prices go down until a rational budget and maintenance program is in place. Do I believe this could ever happen? No. We love to complain about the process because it’s emotional. Instead we should be complaining about the results, which are physical, can be analyzed rationally, and addressed logically. But that’s too much like work. Mr. Pleitner says, "1. Our laws governing truck weight restriction allow for the heaviest loads in the U.S. and Canada. We have the worst." As David Waymire says above, " Re: cutting truck weights, the research all shows the issue is how much weight there is on an axle, not overall weight of vehicle." The weight per axle on Michigan's big trucks is less than the weight per axle on eighteen wheelers. Mr. Pleitner says, "3. Fixed rather than indexed tax rate on gas reduces funds every year. That is nuts!" Proposal 1 would have replaced the fixed excise tax with a percentage tax that would have gradually increased. Do you really think Michigan voters are so stupid as to base their decisions on what a newspaper recommends? We have all learned that newspapers are populated by no more intelligent people than your next door neighbor. They just happen to have a bigger bullhorn. Our distrust in politicians is exceeded only by our distrust in news media. The legislature has not offered a record of trust. During the recent financial crisis the school aid fund was supporting more than the 2% sales tax increase it was approved for. The legislature does not have a good record of keeping its word, this Prop 1 promise had no value. Without adequate leadership in Lansing, improvements will be hard to come by that require a vote of the citizens. While legislators who stayed too long in office had their issues, term limits need to go. We need legislators who can actually negotiate knowing the state laws, rules, regulations and policies.
" During the recent financial crisis the school aid fund was supporting more than the 2% sales tax increase it was approved for." Would somebody please explain what that sentence means? As I drove the smooth roads of one of the poorest states in the country (New Mexico), I tried to wrap my head around the inability of my fellow Michiganders to deal with a complex ballot proposal. I understand that a minority of voters have kids in schools, and that most have little idea what their local municipalities and governmental units do with the state tax dollars funneled their way. But, to cut off your nose to spite your face is simply non-rational thinking. The legislature will now start to look at ways to "rob Peter, to pay Paul" with the two aforementioned government programs bearing the brunt of the cuts. An improving economy will not make up for these cuts just as supply-side economics has not increased wages to any significant extent since it was dreamed up under Reagen's administration. Good luck Michigan! I have enjoyed most of my 65 years in the state, but I will have no regrets moving on to a more rational place. As others have pointed out about Proposal 1, voters were unwilling to dine on this legislative sausage whatever its merits. Voters were hearing too many stories about Proposal 1 to judge which were believable and which not. In cases of uncertainty, stick with the status quo and vote "no." For some voters the only certain thing about Proposal 1 was a tax increase, another reason to vote "no." Moving forward the legislature will have better success if it keeps things simple. Trying to solve every problem with one piece of legislation won't work. Approach things incrementally. Start with a small increase in fuel taxes. Other problems (local government revenue sharing, the EITC, sales tax on fuels, the unfairness of another tax on individuals when corporations have gotten a huge tax cut, weight limit on trucks, quality of the roads built) will have to wait. When all of these are piggybacked onto the problem of inadequate revenues for the roads, the scope of conflict expands, organized interests appear from everywhere, ideologues come out of the woodwork, and not much if anything gets done. The reason that I voted no is simple, and frankly I am surprised and disappointed that it is not listed. It makes me fear for the future of our state and country as most people don't seem to understand how our government is supposed to work. Our system of government is a representative democracy, that means we elect people to go to Lansing and represent us, the people. When our elected officials can't or won't come up with a plan to solve a problem that has been in the making for many years they are failing in their jobs. This may meant that sometimes a Republican has to raise taxes and sometimes a Democrat has to cut an entitlement, it's called doing the work of the people. To then make the people vote on it incurring millions of dollars of additional expense just adds insult to injury. Our representative need to do their jobs or we need to find new ones. I for one voted no because I am sick of my taxes going to pay for big business wants and needs. It was the Mi chamber of commerce who pushed the idea of increased funding for roads over a year ago. They claimed they needed better infrastructure to stay competitive. ( I read this in an article about 1 yr ago.) Yet big business got big tax relief at the same time. Want to fund roads? Eliminate the dept. of economic developement for a start. Thats just a pipeline to move tax money to big business. You have that absolutely correct (grammar?). No bigger waste of money that that organization. It duplicates everything County and local governments already do at a large cost. I'm not willing to support more regressive taxes and fees. We have been DECREASING the income tax rate. It's a flat tax, but still less regressive than sales taxes and fees. Come out with a straightforward income tax rate increase, or better yet, make our income tax graduated. Don't propose a regressive sales tax increase in the Constitution with a bunch of other stuff tie-barred behind the scenes! Michigan is the 11th largest state with the 7 the highest budget and the 4 highest paid legislature in the country that is why I voted no. There is more than enough money on Lansing already, just need to put the house In order and cut out waste. I'm glad Mr. Blakey enjoys the smooth roads in New Mexico, but it would be wise to remember that there's a good reason roads in NM are in better shape than those in Michigan. It probably has more to do with weather than whether a state is rich or poor. New Mexico doesn't have to deal with 5-month winters, where repeated freezing and thawing (and the endless tons of salt) contribute to the deterioration of MI roads. That being said, the frustrating thing about Prop 1 for me is that I already pay taxes--income and fuel taxes--that should be earmarked for road maintenance. At least that's what I thought my taxes were for. Yet over the years, legislature after legislature, whether controlled by Democrats or Republicans, somehow failed to ensure that one of the most basic responsibilities of government--infrastructure construction and maintenance--remained properly funded. Prop 1 supporters who claimed this was the only way to repair our crumbling roads seemed to act as if the funding problem popped up overnight. If I had neglected to make my mortgage payments for years and instead spent that money elsewhere, I certainly couldn't go to my boss and ask for a raise, claiming that I couldn't seem to find enough money in my budget to pay for essentials. But that's exactly what politicians do these days. Over the years, after failing to make tough choices and allocate our taxes wisely, they simply extract more money from taxpayers. Perhaps we should be thankful that at least this time they gave us a choice. On the other hand, I have little confidence that the legislature received the correct message from the 80-to-20 defeat of Prop 1. They'll take it from us somehow. IMO the lesson here is that many taxpayers are tired of being asked again and again to "sacrifice" so that local, state and federal governments can continue to grow and expand unabated, often far beyond constitutional limits. Here's a thought: perhaps taxpayers will be more open to an occasional tax increase once we see government spending held in check or (gasp!) reduced. An antiquated notion, perhaps, but it's healthy to dream big. To Charles Richards and David Waymire, hate to burst your bubble but... heavy loads, even with reduced axle weights do affect the roads more than in other states. As the load comes through the axle and tire and goes into the road, it distributes itself sort of like a pyramid. Axle spacing determines how much of the load is at any one point in the road. The close spacing of axles on these multi-axle trailers mean that at any one point in time, the road is seeing the load that is directly over that point, plus a portion of the load from the axles immediately in front of and behind the axle that is over the point being studied, with the result that the load is probably close to 1.6 times the weight on one axle. The Canadians have large spacing between axles so that they do not get the compounding effect as much as we do. Talking about axle load only is a political game that the trucking industry uses to get non-understanding politicians to increase allowable loads. I voted No not because Proposal 1 was too complex (It wasn"t) nor because money went to schools and the EITC (It should). I voted No because I disagree with the priorities of the governor and the legislators. The roads were just as bad a few years ago and where did the Republicans choose to put nearly two billion dollars? In business tax breaks that were paid for by retirees and contributors to public institutions and homeless shelters. When we have a governor and legislators who put schools, the vulnerable, senior citizens and roads before the wealthy donors to their campaigns, I'll vote for another large tax increase on myself. Until then no matter how bad the roads are and no matter how simple the proposal is, I'll vote No. The problem is not that we need more money, it is that we are spending less on roads per capita than any other state in the union. we spent $305/capita vs some state spending as much as $1400/capita. Other midwestern states with the similar weather conditions spent more. The problem is in the spending priorities. We have made tax cuts to businesses our highest priority and education and roads comes far below that. The people are blaming the legislature but Snyder also needs to be blamed. I see it as a canny move to neglect roads to get the public to ante up some more money for it. Then we get to cut taxes on businesses some more and then we get to be asked again. Enough! Glen I couldn't agree more. Only I think it's been more like 15-20 years our roads have been neglected by MDOT. Local governments receive little more than they did 25 years ago for maintaing state trunklines in their individual city's. A second thing missing in this "proposal" was honesty - it would take the 1st two years to pay off the bonds for money already used by MDOT! Forgot to tell us that. Act 51 is the method for reimbursement to local governments for their streets - it needs to be revised for the lower use of petroleum products today (and in the future). The attempt to buy votes for this proposal from local governments and schools was very apparent. It didn't work because 80% of the voters recognized the pig with lipstick on. The real problem left unsolved now is not only our bad roads, but the big hole in the State budget which required raiding the school funds and revenue sharing for the cities. No wonder Snyder wanted to get to Washington. I voted 'no' because of my complete trust in the legislature. They have demonstrated amazing inventiveness over the past three decades in circumventing the promises and "guarantees" made to spend our tax dollars in accordance with the purposes for which we agreed to pay them. They're experts at promising to spend money only on dogs, then amending the law to say "for purposes of this section, "dog" means any mammal with four legs." Then they say, "See! We kept our promise!" after spending all the money on tigers, elephants and rats. I have absolute trust that given more money, they'd continue to give us more of that same treatment. I voted no based on the recent action taken to shift funds from K-12 to Community Colleges and then move the same amount from Community Colleges to the General Fund. When I asked my local legislator about this at a forum and the "promise" of more money for K-12 as advertised, she said that future state legislatures are not bound by previous promises. It seems that many people are oblivious to the fact that those who have been elected to public office in Lansing are prey to the existing staus quo of disfunctional politics in our State for a very long time. I don't mean to sound like Captain Obvious but this is true as evidenced by: 1. Billions of tax payer dollars are being spent on 3rd party government contracs that equates to our tax dollars and jobs going to other States and even other Countries. Our State is a National poster child for cronyism. 2. Supervisor and Administrator ratio to front line employee is nearly 4 times what the Federal government recommends for optimal government operations. Another example of embarassing cronyism in our State. 3. Front line employees are marginalized and disenfranchised from making cost savings suggestions in spite of the fact that they are delivering the services and know where the cost savings are. 4. The resistence on the part of those elected to public office to transparency and accountability with lobbyist activities and ALL government operations is indicitive of a highly disfunctional and a severe lack of accountability amoung those who are supposed be serving those who are paying their salaries and have voted for them to look out for the general welfare of society. 5. Petty partisan politics that has caused many in elected public office to be out of touch with the everyday citizens of our State. It is up to all concerned civic minded citizens to demand better of all candidates for elected public office and hold them accountable upon entering office. This will require that concerned civic minded citizens who have the heart and talent for serving the public, stand up and run for elected public office and voters to stop listening to professional politicians snake oil salemanship. Voting for the lesser of two evils attitude is still voting for evil. I think our state government needs to better manage the tax money they are already taking in. We have to manage within our incomes, they need to budget better and be smarter about what they spend and where they spend it. If they built better, longer lasting, guaranteed roads they wouldn't have to spend so much on repairs. Equalize our schools so ALL children have quality educations and they wouldn't have to spend so much on criminals. #4 Thing That Wasn't Learned - DO YOUR JOB ! This was a slap in the face to the electorate. An insult. 1) Too many legislators have drunk the "No New Taxes on My Watch" Kool-Aid. They know new taxes are needed but they've signed their name on the dotted ALEC line. If the vote had passed, they could still say, "WE didn't raise taxes - you did." 2) They shirked their duty. They ran for and were elected to an office to represent the rest of us. But for many, the decision they had to make was too uncomfortable. (Poor things) Ah...because they are thinking more about their career than solving the problems at hand. But isn't that what they campaigned to do? I don't remember anyone saying they'll 'try' but if it doesn't work they'll toss it to us to figure out. The comment that the proposal was "too complex" illustrates the condescending attitude toward Michigan voters that is all too common in Lansing. We understood the proposal just fine, thank you. And that is why we threw it in the trash. The more we looked into it, the more insulting it became. And yes, I voiced my opinion on social media as well as the local newspaper. Some of my friends were moved to do the research on their own after reading my comments. That is reality today. We don't have to take what the politicians tell us. I responded to a telephone poll in which the "pollster" insisted upon telling me about all the groups that were backing Prop 1. Endorsements have less meaning when everyone has access to information. I am also tired of hearing that the proposal was too complex. Voters are not necessarily stupid, but they do need to know where to find the small print. The money they said would go to schools and local governments would only replace the money no longer collected through the sales tax on gasoline. I doubt any extra money would find it's way to those 2 funds. A bigger issue for me is that I don't trust them to use the funds for what they are intended, or to use any of it wisely. They recently raided the school fund to cover over 200 million in business tax credits that Snyder said he didn't know about. And they are spending 134 million on new Senate offices. They don't actually care about roads or schools. What angered my husband and me about this proposal was that increasing the state sales tax would penalize the many people who don't even drive or own cars; Prop 1 also had too many open-ended opportunities to add burdensome taxes on to the backs of low-- and middle-class families. What Governor Snyder SHOULD HAVE DONE but did not want to risk in an election year was to raise the gasoline tax to benefit road repairs and construction AND ONLY ROAD REPAIRS AND CONSTRUCTION. Furthermore, the legislature failed to put a weight limit on trucks--Michigan is one of the few states that allow those double-hulled behemoths on our roads. Also, why are the weigh stations so often closed mid-day, when hundreds of big trucks speed past them? It seems as though the State could collect some hefty fees there--certainly worth keeping the station OPEN.